Day 2 of ICAS successfully completed! This is the first day upon which the exhibit hall was open and I spent most of the day making my way around the hall with Rico Sharqawi of Wilco Films. It can get to the point where it takes an hour to go 50 feet. In a good way. It’s running into people you know and people you’re meeting for the first time. And really connecting about their particular take on aviation and how to convey the excitement to audiences. Rico and I are planning to do another debrief tomorrow morning. We’re finding that it’s a great idea to just empty our pockets of business cards from the day before and go over the people we met and talk about some of the synergies that we have with these folks. Or just the amazing stuff that they do. Looking forward to that. 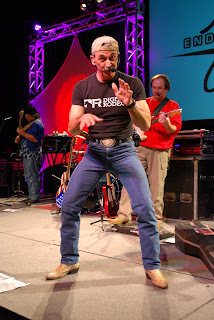 Aaron Tippin gave a performance after the exhibit hall closed down for the day. 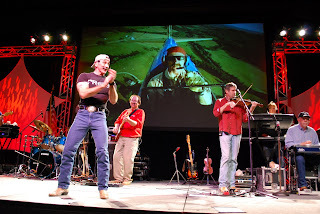 Good performance with footage of him flying his Stearman on the big screen. Even though it was in the big ballroom, that makes for a cozy venue here at ICAS. Probably 200 people gathered around the stage in front with others hanging ou tat the tables in back. I guess that’s just another thing about ICAS. I wandered right up to the stage several times after changing cameras and never had a problem getting there. Nobody throwing elbows. Nobody being a jerk. Everyone giving room to the guy shooting video for the big screens. Jut a great crowd. The sessions kept going today when the exhibit hall was closed. I pretty much hung out in the halls to soak in more of the vibe of the event and to meet additional people. I’m actually in danger of running out of business cards if you can believe that. I find that, in talking to people, they want to know about the show and about what I do as much as I want to know about them. ICAS seems to level out the interactions. 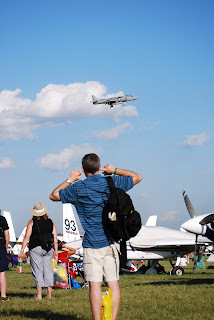 Outside of ICAS, it’s the hero-fanboy relationship at the airshow fence. Here, I get the feeling that if you’ve come to the effort to come to ICAS, you must be serious. No posers here. Or at least not many. And you can stand around and have a beer with Greg Koontz or Gene Soucy or Theresa Stokes or the Misty Blues (all-woman skydiving team), or Scott Lane and the list goes on. Jay, one of the pilots from Speed and Angels bought be a Leinie’s. Just out of the blue. It’s that kind of community. 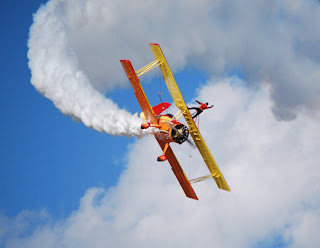 If you’re there, you’re serious about aviation and airshows. It’s just assumed. I’m still finding that I have to explain what a podcast is, but people are interested and actually want to know. It’s really had the effect of refining my elevator pitch, if nothing else. I need to get across what I do and the audience for whom I do it. All in about 60 seconds in a crowded and exceedingly noisy room. It’s a challenge, but I think the message gets across. And it’ll ultimately benefit the whole new media community if we get the word out about the depth of the coverage that we can do. I neglected yesterday to go over the presentation that came immediately after the new media panel. 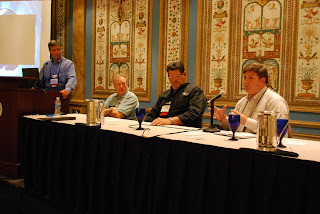 Announcer extraordinaire Rob Reider moderated and Roger Bishop served on the panel. They covered how to leverage video for the airshow experience, both for big screens on site and for distribution to remote audiences. These guys can wire and aircraft for video and sound in about an hour and set up the ground stations and production trucks to assemble the programking in a really immediate way. It might seem simple, right? Sure, if the aircraft is only going to fly straight and level. But straight and level isn’t very exciting. If the aircraft is going to yank and bank, you need to have antennas with a line of sight to the ground systems at all times and that means antennas that aren’t blocked by the airframe itself. Suddenly, you’re talking whole new levels of complexity. I saw the video production for the on-site presentation at the Indy Airshow this summer and it was great. You really have to involve the performers, the announcer, and everyone else to bring it off. It adds a whole new level of complexity because everyone’s now thinking about not just the pure acro visible along the crowd line, but the added elements of the video. Now the audience gets to see inside the cockpit and outside from the perspective of the performer and the aircraft. And you have to think about how to make that compelling – not just to an aviation fanboy like me, but to the average airshow attendee. 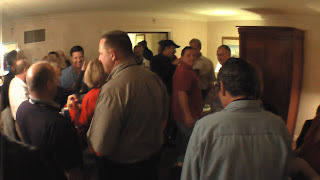 The mixing and getting to know people continued after the Aaron Tippin show. Mainly down at the bar near the elevators in the lobby, but in other places as well. The above shot is not intended to be great art. It’s not. It’s just to give you an idea of how crowded and great things get. I spent an hour or so up in the Air Show Aces hospitality suite. The Air Show Aces are Kent Pietsch, Gene Soucy, and Warren Pietsch with announcer Danny Clisham and wingwalker Theresa Stokes. 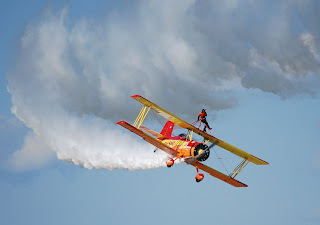 These folks can put on a almost two hours’ worth of airshow all by themselves by combining their skills and resources to form 12 discreet acts. Unreal. You guys know how much I love Gene’s Show Cat and the noises it makes. And the rest of the acts are great, too. The picture above gives you a good indication of what it’s like. Wall-to-wall people, most of them pilots to one extent or another, and everyone talking or shouting across the room. I saw that John Mohr had brought up two guitars (my kind of scene!) but the party was too thick to really break them out and I didn’t have enough energy left to wait until things dissipated. So I retreated to the room to edit some audio and get stuff ready for recording the show tomorrow. Hard to believe that I have to leave at noon tomorrow to head home. Wednesday is going to be ugly. I’ll review a few deals tomorrow on the plane and try to be ready to return to normalcy, but it’s not going to be easy. More soon from ICAS 2009!